Cost: $ 40.00 USD in advance; $50 at the door. Dalylah will introduce and differentiate the concepts of shaabi and baladi, as she teaches combinations and short choreographic sequences. DEADLINE TO SIGN UP ONLINE EXTENDED UNTIL 7/16/2013!!! 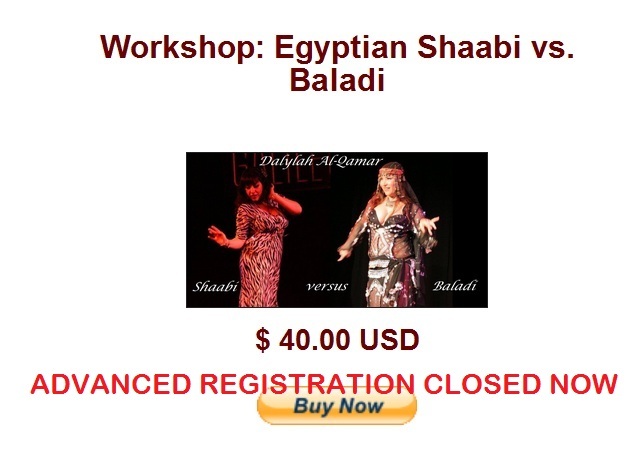 Dalylah Al-Qamar is a well-known Oriental Dance professional acknowledged internationally. 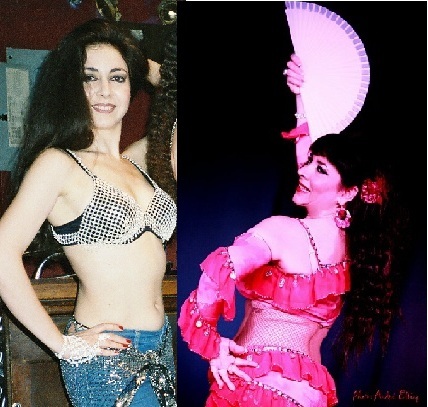 With a strong background in Egyptian Oriental, due to her long-term and frequent exposure to teachers of the stature of Mahmoud Reda and Raqia Hasan, among others, her signature is her own unique style BellymCo, Oriental Dance with Spanish touch, where she gives Bellydance a new dimension, melting the purest classical and folkloric tradition with the flamenco flavour. Dalylah has been Mr. Reda’s teaching assistant when he teaches in Madrid, because she has mastered his style knows his old choreographies. She has also mastered the Farida Fahmy elegant and classical style that made her famous in the Reda troupe musical movies in Egypt. Since 2005, she has also been a dance assistant for Yousry Sharif, Mohamed Kazafy, Khaled Mahmoud when they were visiting guest teachers at Raks Madrid (a periodical dance festival in Madrid). In addition to teaching regularly at Escuela Colorado and Al Andalus School (Madrid), Dalylah’ s artistic career involved teaching at several prestigious international events. Dancing has been Dalylah Al-Qamar’s passion since birth. As a child, she learned ballet, Flamenco and natural dancing techniques, until she finally met the love of her life: Oriental Dance. Her university degree in Arabic Philology opened the door for her to the amazing Arabic culture, and its purest form of art: Bellydance. Dalylah’s unique style uses an accurate and diversified technique only to serve her best quality: expression. From a classical delight to provocative innovations, Dalylah Al-Qamar dares with a wide range of different artistic ways of expression. 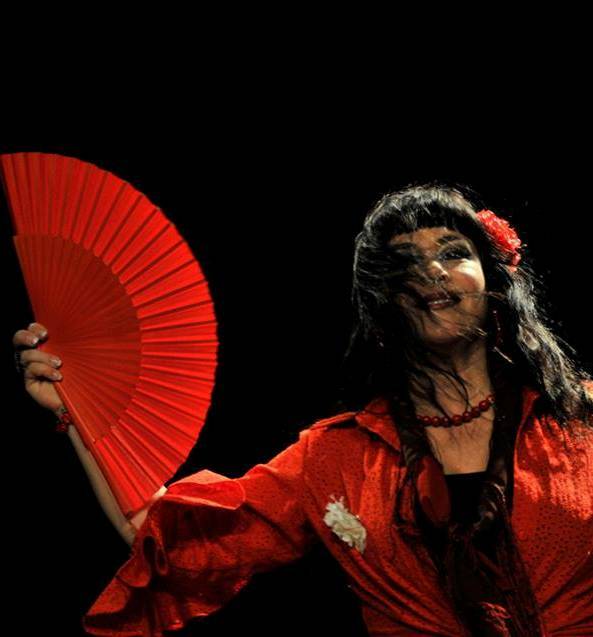 Come learn flamenco from a native Spanish professional dancer and teacher. She will introduce enough technical aspects that we'll be able to learn her fusion choreography in the next workshop, but this class could also be taken by anybody with an interest in enriching their flamenco knowledge. She will explain how to dance with a fan (abanico). This is NOT a fan veil, but just a traditional fan. Bring any fans you have, please. There will be some fans available for sale (direct from El Rastro, Spain). We will learn a choreography in Dalylah's signature flamenco fusion style. She describes it as "simple but powerful" and involves the use of a fan. Dalylah will offer some fans available for sale (from El Rastro, Spain). Do you want to learn how to dance like Shakira, to shake your hips, and move your body like the famous pop star? Seyyide, a proficient belly dance teacher and performer, who is also a Latina by birth, will offer a FUN workshop to learn to dance like Shakira. You will learn some individual moves, and how to put them together to dance to one of Shakira's songs using a choreography based on her movements. Seyyide usually teaches this class as a 6-hour program, but will teach as much choreography as the time available allows.